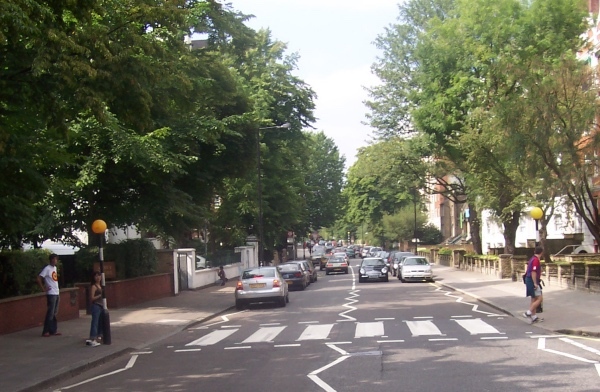 This district in west London – located to the south-west of St Johns Wood – takes its name from the Italian town of Maida in Calabria where, in 1806, the British won a victory over Napoleon. Led by Sir John Stuart (later Count of Maida), about 5,000 British troops defeated a larger number of French in a battle in what was a much-needed boost to the British after the defeat at Austerlitz in December the previous year. There was apparently a pub located in the area named, in the wake of the victory, ‘The Hero of Maida’ in reference to Stuart and his role in the battle. The pub has since gone but its name lives on in the street and the district which still carries it. 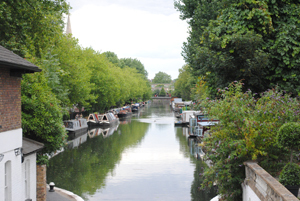 Landmarks in Maida Vale include the basin – complete with houseboats and the puppet theatre barge – known as Little Venice (some say this name was coined by poet Robert Browning; others attribute it to Lord Byron) where Regent’s Canal meets with the Paddington arm of the Grand Junction Canal (pictured is Regent’s Canal looking toward Little Venice). Maida Vale is also home to the BBC Maida Vale Studios (on Delaware Road) while notable residents have included computer science pioneer Alan Turing who was born at 2 Warrington Crescent in 1912 and David Ben-Gurion, first Prime Minister of Israel, who lived at 75 Warrington Crescent. The area to the south-west is unofficially known as Maida Hill and this was apparently initially the name used for the entire area until the more romantic Maida Vale came into usage in the mid 19th century. Maida Vale also gives its name to a Tube station – it opened in 1915. Dwarfed by the towering form of Nelson’s Column in the southern part of Trafalgar Square, the four lions at the base of the column’s plinth – known to some as Landseer’s Lions – are now a favourite of tourists and Londoners alike. But it wasn’t always so. While the column was erected in 1843 and the fountains in 1845, it wasn’t until 1867 that the lions – designed by Sir Edwin Landseer – appeared in the square. The reasons for the delay were apparently several including arguments over the artistic vision of the sculptures and funding and Landseer’s own ill-health. Indeed, Landseer, best known as a painter of animal subjects, wasn’t the first choice as sculptor but was only commissioned after the models of the first sculptor – Thomas Milnes – was rejected (there’s a terrific painting by John Ballantyne of Landseer working on the lions in the National Portrait Gallery). As a result when the lions were eventually unveiled, they were held to general ridicule when they finally arrived, costing thousands of pounds more than what had been budgeted for them. 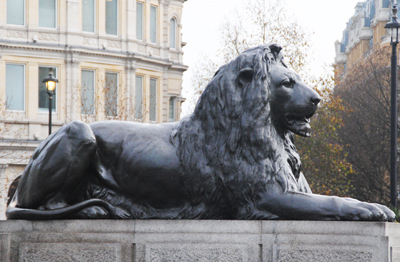 While the lions were initially going to be made of granite, Landseer’s 20 foot long lions were cast by Baron Marochetti in bronze at his Kensington studio. The form of the lions was apparently modelled on a dead lion which, according to Ed Glinert in The London Compendium, were brought to his studio in St John’s Wood by cab from the London Zoo, although all four lions have distinct faces. Legend has it that the Grade I-listed lions will come to life if Big Ben chimes 13 times. There has been concern in recent years about the damage people are doing to the lions in climbing on them with one report recommending that the public be banned from climbing on them. For more, see our previous posts on Nelson’s Column and Trafalgar Square. For more on London’s monuments, check out Peter Matthews’ London’s Statues and Monuments (Shire Library) . While England and Australia played their first test match as far back as 1877 (at the Melbourne Cricket Ground), the origins of The Ashes go back to a game played at The Oval (now officially known as The KIA Oval) in Kennington in 1882. Playing their only test of that tour, the Australians only made 63 runs in their first innings, giving England a 38 run lead with a total of 101. Australia followed this up with 122 leaving England just 85 runs to win. They were stopped just eight runs short of victory. 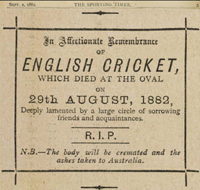 The English team were berated in the press for the loss and on 2nd September that year, a mock obituary for English cricket appeared in The Sporting Times stating that, having died at The Oval on 29th August, 1882, it will be “deeply lamented”. There was a note at the bottom of the obituary (picture right) which said that the body would be cremated and the ashes taken to Australia. And so the name, the Ashes, was born. English captain Ivo Bligh subsequently promised that he would regain the ashes during the 1882-83 English cricket team’s tour of Australia while the Australian captain WL Murdoch vowed to defend them. It was during a social match played at Rupertswood Estate outside the city of Melbourne that Bligh was presented with the tiny terracotta ashes urn (today on display at the MCC Museum at Lord’s – see our earlier post for more). The history of The Oval goes back to the mid-1840s when, following the establishment of the Surrey Cricket Club, it was granted a lease for the land from the Duchy of Cornwall (who still own it). The Ashes aside, memorable moments there have included the playing of the first match in the Australian Aboriginal team’s tour of England in 1868 (the first tour of England by a foreign side) and the first England v Australia test match to be played in England (1880). The Oval was also the location for the first international football match, played between England and Scotland in 1870, and the first FA Cup Final, played here in 1872. Interestingly, The Oval also held a particular attraction for the US billionaire philanthropist, J Paul Getty II, who built a replica of the ground at his estate at Wormsley Lodge in England’s south. The history of Lord’s, London’s most famous cricket ground, meanwhile, goes back somewhat further. The current ground is the third to bear the name of Lord’s – the first was created on what is now Dorset Square in Marylebone at the behest of entrepreneur Thomas Lord (from whom it derives its name) and the first match staged there in 1787, the date on which the Marylebone Cricket Club was formed. Between 1811 and 1813, the ground was relocated to Marylebone Bank in Regent’s Park before moving to its current home in St John’s Wood (then the site of a duck pond). Both grounds continue to host a range of cricketing and other events, such as the current Olympic archery competition being held at Lord’s. WHERE: The Oval, Kennington Oval, Kennington (nearest Tube stations are Oval, Vauxhall and Kennington); WHEN: 90 minute tours of the ground are available (check website for booking details); COST: Tours cost £10 an adult/£5 under 16s/£25 a family ticket; WEBSITE: www.kiaoval.com. 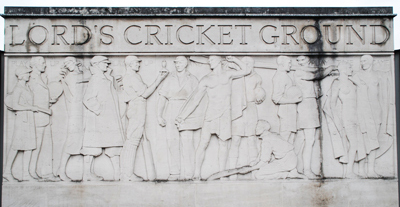 WHERE: Lord’s Cricket Ground, St John’s Wood Road, St John’s Wood (nearest Tube Stations are Warwick Avenue, St John’s Wood, Marylebone and Maida Vale); WHEN: 100 minute tours of the ground (which include a visit to the MCC Museum) are available daily (check website for times – note that there are no tours during the Olympics, these resume on 21st August); COST: Tours cost £15 an adult/£9 concessions/£40 a family ticket; WEBSITE: www.lords.org. In honor of the Olympics, we’re staying with a sporting theme over the next couple of weeks and so this week thought we’d take a look at the oldest sports museum in London – and, it is claimed, the world. The Marylebone Cricket Club (MCC) Museum is located at Lord’s Cricket Ground in St John’s Wood, just north-west of the City (keep an eye out for our post on Lord’s later this week), and is said to have been collecting cricket-related artefacts since as far back as 1864. The star sight on display is that tiny urn, known simply as The Ashes, which was given to English captain Ivo Bligh during the English cricket team’s visit to Australia following a game on an estate outside Melbourne on Christmas Eve 1882 (the term was actually first used in August that year when, following an English loss to Australia, at The Oval, The Sporting Times ran an obituary for English cricket and said its ashes would be taken to Australia). The museum also contains cricket equipment used by some of the game’s greats along with memorabilia celebrating the likes of WG Grace, Victor Trumper, Jack Hobbs, and Donald Bradman as well as more recent players Shane Warne, Rahul Dravid and Paul Collingwood. Other exhibits include the Wisden Trophy, a stuffed sparrow bowled out by Jehangir Khan in 1936 and the battered copy of Wisden’s which EW Swanton used to help him survive a World War II Japanese internment camp. There is also an extensive collection of cricket-related paintings and photography and a theatre – the Brian Johnson Memorial Theatre – which screens archival cricket footage. It should be noted that the museum is closed during the Olympics (until 15th August) when Lord’s is playing host to the archery competition (people attending the archery, however, will have free entry). In celebration of the archery, the museum is hosting an exhibition of trophies and pictures related to archery, the centrepiece of which is an arrangement featuring the Musselburgh Arrow and Medals, prizes which have been competed for since 1603. WHERE: MCC Museum, Lord’s Cricket Ground, St John’s Wood Road, St John’s Wood (nearest Tube Stations are Warwick Avenue, St John’s Wood, Marylebone and Maida Vale); WHEN: Weekdays (with exceptions – check website for details and times); COST: £7.50 an adult/£5 for concessions (or included with tours); WEBSITE: www.lords.org. 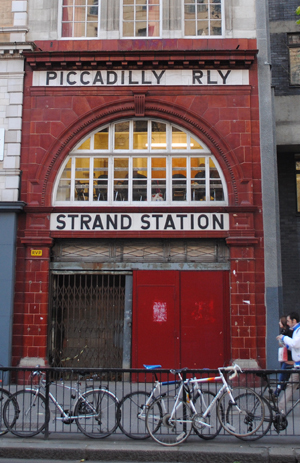 • Sixteen London Underground stations were this week listed as Grade II heritage buildings. The Tube stations – several of which were designed by Leslie Green, known for his pioneering use of ‘ox-blood’ red tiles on the exterior of stations to create a consistent brand for the stations – include the now-closed Aldwych (pictured) along with Oxford Circus (originally two stations), Covent Garden and Russell Square as well as Belsize Park, Brent Cross, Caledonian Road, Chalk Farm, Chesham, Perivale, Redbridge, St John’s Wood, West Acton and Wood Green. Three other stations – Arnos Grove, Oakwood and Sudbury Town – have had their status upgraded from Grade II to Grade II*. These three were all designed by modernist architect Charles Holden for the extension of the Piccadilly Line in the 1930s. The new listings were made by Tourism and Heritage Minister John Penrose on the advice of English Heritage. • A new permanent exhibition showing would-be sailors what it is like to fight at sea opens at the HMS Belfast this weekend. Gun Turret Experience: A Sailor’s Story, 1943, is an immersive experience using lights, imagery, sound, smoke effects, movement and smell to recreate the atmosphere and conditions of a gun turret tower when a crew was at battle stations. Visitors are encouraged to follow the story of a young sailor on Boxing Day, 1943 when the German battle cruiser Scharnhorst is sighted leading to the Battle of the North Cape. The Gun Turret Experience, housed within the original triple gun turrets overlooking the quarterdeck, was developed with the help of Royal Navy veterans and eye-witness accounts from the Imperial War Museum (of which the HMS Belfast is part). Entry is included in normal admission price. For more information, see www.hmsbelfast.iwm.org.uk.